At the half-way point, positive results are a possibility in all six games - with defending champions Yorkshire looking in ominous form at Headingley. Jonny Bairstow and Liam Plunkett hammered the Hampshire attack to all corners, while Derbyshire's Wayne Madsen compiled a century of a very different character at Bristol. Not such a good day for England captain Alastair Cook, who changed helmets to comply with new safety regulations and lasted only five balls. C'est la vie. We'll be back on Tuesday from 10:45 BST. Have a good evening. Play comes to an end at Bristol with Gloucestershire having made the kind of start they were hoping for in response to Derbyshire's big first-innings score. Chris Dent is on 61, with nightwatchman Liam Norwell two not out. The visitors will hope for better luck with the ball on Tuesday morning following Wayne Madsen's patient 150, which provided the ballast for their total. ..By 'good news', I mean the prognosis that he'll be back in a fortnight, not that he's had an operation. I bet Luke's wrist is pretty tender. Will that be the final wicket of the day? Australian Cameron Bancroft departs after an excellent opening stand with Chris Dent, who remains on 55 not out with four overs left. After the teams go off for bad light in Cardiff, play ends with Leicestershire 51 runs behind, but with four wickets standing. Niall O'Brien will rue missing out on a century after falling for 93, but Wayne White is still there on 42 to give the Foxes hope of achieving close to parity on day three - or perhaps even a lead. Lancashire will be happy with the position they find themselves in after being 156-5 earlier in the day. Two of their younger brigade, Liam Livingstone (63*) and Alex Davies (55), have steered them to a handy lead, with the prospect of more to come on the third morning. Stuart Broad and Jake Ball were the pick of the Notts attack, with matching figures of 3-57 - and Broad may permit himself a wry smile after dismissing England team-mate James Anderson. Gloucestershire opener Chris Dent reaches an 89-ball fifty with four runs off Andy Carter and follows it with another to take his boundary tally to nine. Still five overs to go at Bristol. Lancashire manage to earn a third batting point before the end of the 110th over as Zimbabwean Kyle Jarvis provides determined support for Liam Livingstone. They have added 60 so far and with three overs remaining, the Red Rose county are in a useful position. "Day two will be remembered for stunning Yorkshire batting, which produced 236 runs in the morning session. We saw personal bests for Jonathan Bairstow (246) and Liam Plunkett (126), providing entertainment of the highest class before the home side declared. "Hampshire are now trying to save the match, which is an enormous task. Skipper James Vince has been defiant with a splendid 76 not out, but the champions are taking wickets steadily and are well on top." Is that it at Bristol, I asked a few minutes ago. No, it isn't and Gloucestershire openers Chris Dent and Cameron Bancroft are back out there with nine overs remaining. 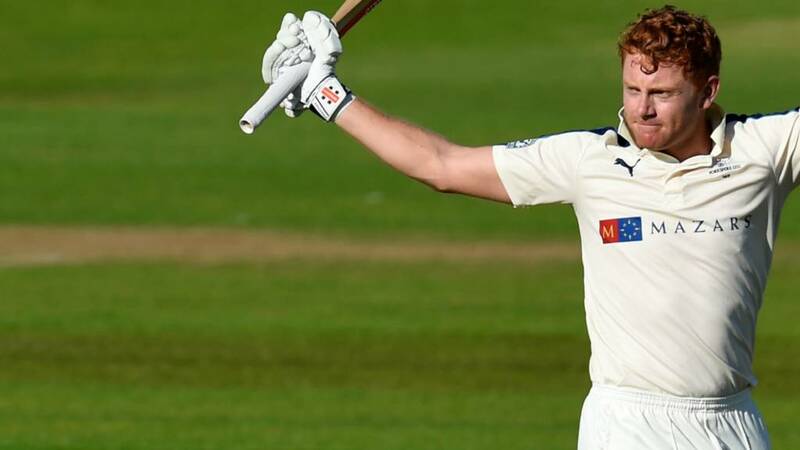 Sam Robson's career-best 231 for Middlesex was the highlight of day two at the home of cricket and their bowlers have worked hard to press home their advantage. Ian Bell only managed 14 for the Bears, but Jonathan Trott will resume on 62 not out, having struck nine fours in his 115-ball innings, with his side trailing by 306. That's your lot for the day at Hove where the light shows no sign of improving. Sussex will be hopeful of a handy first-innings lead, but Tom Westley (86) and Jesse Ryder (51) batted well for Essex and they could yet surpass the home side's total if Ryan ten Doeschate (32*) and Graham Napier (13*) can see off the new ball on the third morning and extend their 33-run partnership. Is that it for the day at Bristol? If so, Gloucestershire have made a good start to their reply following Wayne Madsen's hundred for Derbyshire earlier in the day. Chris Dent is just four runs away from a half century and Australian Cameron Bancroft has 37 to his name - both openers having hit seven fours so far. What a remarkable performer Ryan Sidebottom is. He has now taken 708 first-class wickets at a cost of under 24 runs each. If only England - for whom he played just 22 Tests - could find another left-arm swing bowler like him now. The dismissal of Liam Dawson gives the 38-year-old figures of 2-15 from 12 overs, and it is quickly followed by James Tomlinson's exit, caught off Liam Plunkett. James Vince is still there on 70, but it's odds-on Hampshire will be following on tomorrow unless a miracle occurs. A third match falls victim to fading light with Leicestershire struggling to try and establish a first-innings lead at the Swalec. Wayne White is 42 not out, with Ben Raine on seven, with Glamorgan still 52 runs to the good. "The umpires have taken the players off at a chilly Lord's with Warwickshire on 146-4. "It is holding up an intriguing contest with Jonathan Trott (62) defying a lively Middlesex attack." You may recall that Liam Livingstone hit 350 off 138 balls in a club game for Nantwich Cricket Club last year. Given his first-class debut by Lancashire in this match, he has responded to cricket director Ashley Giles' show of faith with a patient fifty off 87 balls, with only six fours. The Red Rose county have their noses in front, but how far can Livingstone stretch the lead with only tail-enders for company? The morning sun which prompted staff to put the deckchairs out at Hove has given way to post-tea gloom, persuading umpires Paul Baldwin and Tim Robinson to halt play. There are 13 overs left in the day, if play resumes, with Essex skipper Ryan ten Doeschate 32 not out and Graham Napier on 13. "The new ball is due, but with dark cloud all around Hove that could be that for the day. "A good fightback from the Essex lower order has reduced the deficit to just 108, and Sussex will hope the new ball will lead to a quick conclusion and a useful firs-innings advantage." Niall O'Brien didn't manage a single Championship century for Leicestershire in 2015 despite passing 50 seven times - and he's going to have to wait to make one this season after Graham Wagg removes him in the first over with the new ball. Wayne White remains on 35 not out after a 56-run partnership with O'Brien.